Elgin Court Public School is well on its way to creating an outdoor, educational space or “green space”. 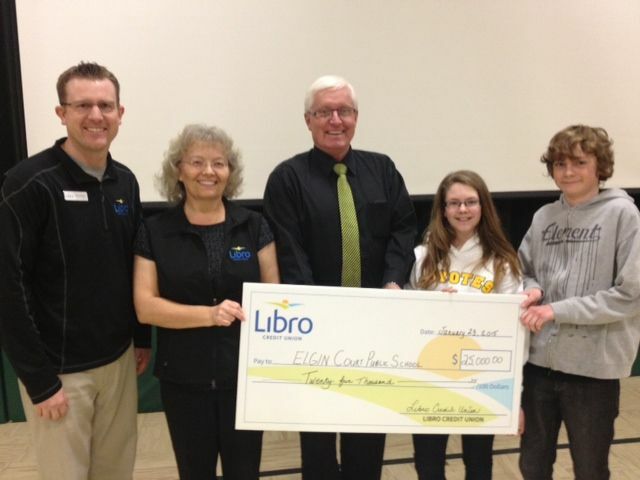 Libro Credit Union’s Jesse Brown made a $25,000 cheque presentation to the school on Friday (Jan 23). The school is one of the recipients of Libro’s 2014 Community Builder Grant. Member of the Community Investment Advisory Panel Maria Konefal helped in making recommendations to the Libro Board for the distribution of funds. Bob Ward with the Auto Guys helped the school obtain this Libro Grant along with Bob Allen. He also helped secure a CAA grant of $20,000 for the project. $5,000 was also raised through Elgin Court’s PTA. Construction of the green space is hoped to be complete by spring.